FORMER NSW premier Morris Iemma has become the most senior Labor figure to oppose Julia Gillard’s carbon tax. Mr Iemma says the carbon tax that forms federal Labor’s platform for re-election in 2013 is environmentally marginal, economically costly and likely to lead Labor to a historic electoral train wreck. “One thing is sure — it won’t change the world, but it could change the government,” Mr Iemma told The Australian. Mr Iemma accused the Gillard government of betraying the Hawke-Keating legacy of economic reform, instead embracing the environmental policies of the Greens’ agenda. Mr Iemma accepted the science of climate change. “Yes, we should take action, but we should not get so far out in front that we injure ourselves,” he said. He rejected the government’s view that Australia’s carbon tax was similar in scope to actions being taken by other countries. “Every day there are reports of growth and development in China, its growth in emissions will far outstrip our total emissions,” Mr Iemma said. Wonderful stuff. Morris Iemma is doing nothing more than speaking plain common sense, which as we all know, is very uncommon. With such senior members of the Labor movement speaking out publicly, and with two major unions rejecting the tax in the last week, serious cracks are appearing. « Even warmists think Gore's Climate Reality Project is "fairytale"
“Bob Brown wants to replace the Labor Party as a major party…..
Mr Iemma WELCOME TO THE CLUB! The great conclusion to be drawn is that there are labor rumbles with JULIA’S tree climbing! The Q is Mr Iemma what are you NOW going to do ? Wait and hope for JULIA to fall out of the tree or take an axe and chop her tree down? 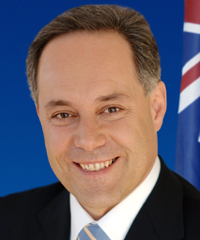 Whilst Morris Iemma failed miserably as state premier of NSW, at least he has the guts to come out and say what a lot of Labor politicians would be thinking about now – so kudos for that. The proposed support for the carbon dioxide tax, since the full package was announced, has failed to materialise. It’s time for the Labor Party to ditch its green leanings and get back to reality before its too late – if its not already. Not significant enough for the ABC apparently. No mention of this on ABC’s website – as in zero – zip – zilch! No wonder is now called the ALPBC. “Mr Iemma accepted the science of climate change. “Yes, we should take action, but we should not get so far out in front that we injure ourselves,” he said”. Wrong Mr Iemma! No need to take action. Same old calculation; OZ carbon dioxide contribution to atmosphere = 0.0000171% (f*ckall – have not found an instrument that can measure this). Were are already freezing our ***** off! I agree, but from someone who accepts the science, the argument that the carbon tax is the wrong policy is made even stronger. We will know the tide has turned when publication of a contrary view is no longer contingent on this grovelling nonsensical caveat. I believe the Carbon Tax will ruin this country. It is time that someone put a stop to this madness while there is still time.